James Harrison Wilson Thompson, better known as Jim Thompson was an American born businessman who moved to Thailand to help revitalise the silk industry. 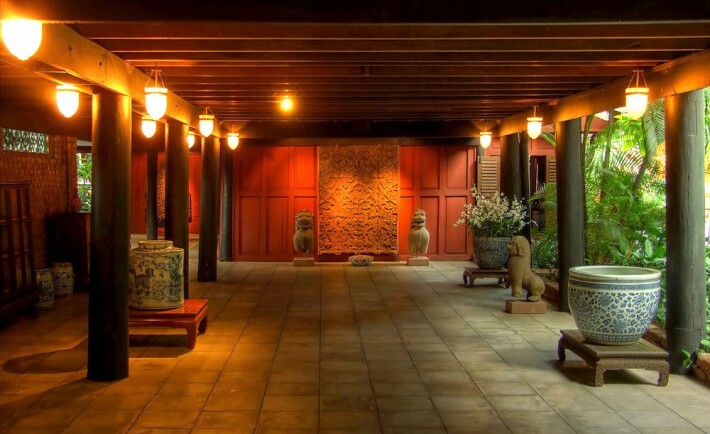 The former residence of this entrepreneur is now a museum known as the Jim Thompson House Bangkok. Without his help the Thai Silk industry would have almost certainly petered out to near extinction, instead it is now a thriving industry. Jim’s love affair with South East Asia and in particular Thailand started when he was posted there during the war, and later remained on as an OSS station Chief. After his discharge from US military service in 1946, Jim returned to Thailand to set himself up in business and dedicating his time to reviving the flagging silk industry. Jim is responsible for connecting this small backyard industry to the major fashion houses of the world. In fact Jim would dedicate the next 20 years, right up to his disappearance in 1967 to the industry. After nearly ten successful years running the Thai Silk Company, Jim had amassed a considerable wealth. It was with this new found wealth, his architectural background and love of the Asian culture that inspired him in 1958 to start constructing his own home along the banks of the Saen Saeb Canal. The home was not just a home for Jim and his family, it was also to be a home to ever growing collection of Asian antiques and artifacts. Jim was very meticulous with his design and was intent on authenticity. In fact he went to extreme levels to ensure his estate was 100% authentic. He shipped parts of older Thai houses, some which were over a century old to the estate to use as part of his new home. Most of the parts came from the old capital Ayutthaya, and a few from Bangkurua. For those parts where Jim could not source originals, he commissioned new sets to made using the finest Thai craftsmen available. The result of all this is a superb example of a traditional Teak Thai home. Once construction on his teak wood villa complex was complete in just over a year, Jim set about filling it with his collection of fine Asian and European antiques. The house is now one of the world’s finest examples of East meets West museums anywhere. Upon entrance into the main house (living quarters) your eyes are automatically drawn to the eccentricity of Jim’s design. Italian marble flooring is covered by a hand carved teak ceiling draped in Belgium chandeliers, whilst Buddha images and Asian figurines adorn the wall paneling. On the upper level you will be greeted by decorative wall mountings, saved from various temples across Thailand. Most of the upper floor is dedicated to Buddhism and relaying the story of Buddha’s journey to enlightenment through hanging wall art. Around the rest of the six houses you will find pristine artifacts from the rest of Asia including porcelain, teak furniture and Chinese Mahjong tables. After Jim went missing presumed dead an administrator was appointed to manage the estate. The Jim Thompson’s House the Museum was born. It is now a thriving museum and tourist attraction and one of Bangkok’s most visited sites. As well as the collection of art and artifacts, there is also a restaurant, cafe and souvenir shop. In addition to the normal tourist trade, the home also has extensive banqueting facilities which can easily cater for large groups of 50 plus in the stunning canal side setting. It is regarded as one of the capitals premier wedding venues for young high-so Thai couples. The museum is open daily from 0900-1700 and runs guided tours in several major languages throughout the day, which are included in the entrance fee. Getting there is fairly easy using public transport, simply exit the BTS system at the National stadium station and turn down Soi Kasemsan 2 and stroll to the end of the Soi (about 10mins max) and the Jim Thompson house will be on your left, you cannot miss its distinct setting. Of course you can also take an organised tour.